Have you ever had a blackhead or blemish you just couldn't get? Then this is the extractor kit you need to try. It's professional grade tools that an Aesthetician would use. 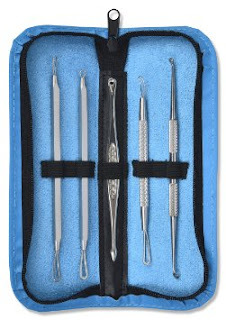 It's a 5 piece kit, a double loop extractor, a single loop extractor, a fine loop extractor, and 3 lancets in different sizes, all in a zippered leather case. Blackhead & Blemish Extractor Kit should be in every medicine cabinet. It's good to have the right tool for something like a blemish, instead of causing more damage to your skin.I really like this kit. I received this product in exchange for an honest, unbiased review.